Engine Four stroke, transverse four cylinder, DOHC, 2 valves per cylinder. BIKE'S FIRST test of the Yamaha XJ900 appeared in September 1983 under the inspired title "Nice pace, shame about the legs." Julian Ryder's way of saying it went like a train but handled like a mad cow on roller skates. 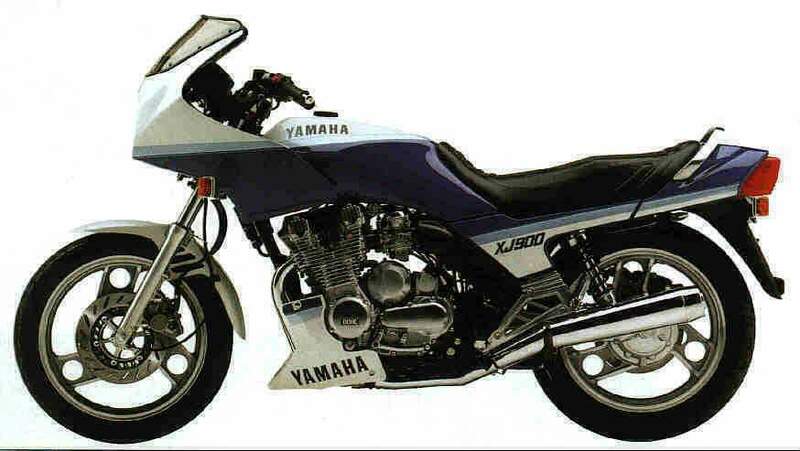 A year later Yamaha claimed to have licked the wobble problems by dumping the handlebar-mounted fairing and fixing a bigger version to the frame. 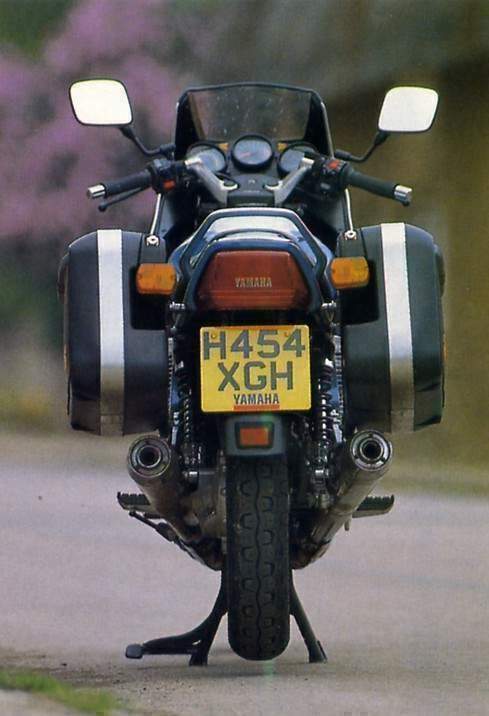 A sporty belly pan/engine cowl appeared and basically, that's the way the XJ900 still looks today. Over the years the anti-dive kit on the front forks has disappeared, the barrels of the 853cc engine have been scraped out to 891cc and fed by carbs 1mm bigger at 36mm. These aside, what we have here is the original retro bike. 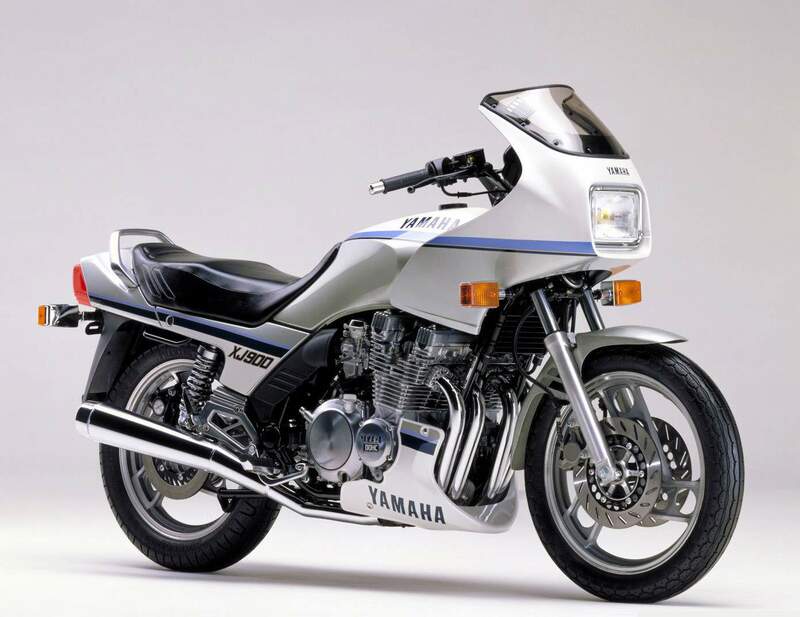 Unlike Kawasaki who has had to create a new 'old' bike, Yamaha simply carried on making its all-round sports tourer for almost a decade. Steady sales have kept the XJ on Yamaha's model list, and a walk around the car park of many a biking event reveals large numbers of them many with high, trouble-free mileages. One despatching owner told me recently how he transferred 25,000 mile old spark plugs into his latest XJ and did another 23,000 miles - and it still starts first prod. The XJ900 looks old-fashioned. The line of the fairing and tank/seat styling tell you it's been around a while. Throw a leg over the saddle and the seating position tells the same story - it feels like all good bikes used to. At 5' \0'A" I had both feet firmly on the ground. In 1983 the handlebars could be adjusted to all kinds of jaunty angles but now they come fixed in the best position. Footrests are lower than on other modern bikes in the sporting tourer class and don't require creaky old knees like mine to bend far. The instrumentation inside the fairing is nicely laid out and everything is there. Tachometer takes centre stage flanked by big arrow shaped indicator warning lights. Turn indicators are the excellent Yamaha self-cancelling type. The left-hand dial is a 150mph speedo, the optimistic needle of which can be coaxed satisfyingly almost all the way. Balancing out the speedo on the right is a third dial containing a fuel gauge and a clock. The digital clock on our test bike was infinitely more useful than the fuel gauge which read cup-runneth-over-full even as the tank ran dry. It was bust and I'm sure any dealer would have fixed it in a trice. Completing the cockpit view of the world is a pair of splendid mirrors. These are handlebar mounted in the time-honoured tradition and give a good view of what you're leaving behind. At high speeds the vibration fuzzes the images slightly but patrol cars are still instantly recognisable. The left mirror had a tendency to vibrate downwards twisting the left-hand switchgear round the 'bar with it. Half a turn on the clamp screw put paid to that nonsense. Starting was never a problem throughout the two week test period. A choke knob on the side of the bank of carbs sorted the mixture for cold mornings. The shiny old two valves per cylinder, double overhead cam, air-cooled in-line four is pleasantly quiet, its trilling, whirring, whistling clutch sounds like a 747 just cleared for take off. I found the clutch a touch heavy although I suspect a dodgy cable. Liberal application of 3-in-l every night didn't ease the problem and, in fact, I got so fed up with hauling in the lever I started to avoid using the clutch wherever possible. This behaviour compounded an already clunky gearchange and shaft drive. You couldn't describe take off as a rush of power. You could have once upon a time. In fact Ryder's description of the 853cc version's getaway likened it to a scared ferret. Ferrets are quicker these days. The XJ900 pulls steadily to its indicated top speed of 135mph with the dogged perseverance of a stubborn mole. The engine vibrates, but not uncomfortably, and feels tough. The red line is at 9500rpm, maximum power 500 below that at 9000rpm and maximum torque is produced at 7000rpm. You have to use the gearbox to keep the engine spinning above 6000 and enjoy life to the full, but the motor is very tractable and low engine speeds round town didn't cause any snatching problems. Gearchanging was the only real glitch in the drive train. Sometimes the box refused to engage the next cog up, occasionally a new and unexpected neutral appeared on the way down. Clunking from the shaft was confined to setting off. The shaft soaks up a few of those 92 ponies the engine puts out, but the XJ900 is no roadburner so it's a small price to pay to forget about broken chains and Watch out tor the white lines was the advice from managing director and former biking scribe Malcolm Gough as I left a lunchtime meeting. I already knew what he meant. To say the XJ900 is twitchy on road paint is like saying Constable was competent with oils. The front Phantom skipped about on centre lines and those boxes with the diagonal markings led the bike a merry dance. If you buy an XJ900 I recommend you try every tyre combination available to cure this. If you find a solution we'd love to hear it. Blame for the Yamaha's other handling trait could be laid, if you'll pardon the expression, at the feet of the boots too. The bike starts to weave at exactly HOmph. If this speed wobble was worse with a handlebar-mounted fairing back in 1983, then I'm glad it wasn't me who wrung 127mph out of the bike. If you hang on tight and keep the power on things start to straighten out but any change in momentum or curves and bumps in the road at 110mph and the XJ shakes its head with a vengeance. The only good thing about this kind of behaviour is its predictability — 110mph and white lines, avoid them at all costs. It would have been nice to try a steering damper but little would be gained from fitting a fork brace as there's one there already, doubling up as a front mudguard bracket. Twin rear shocks perform much as you would expect them to in these days of sophisticated monoshock systems — a bit crude but okay. A 14 stone pillion added to my 13 stone bulk had the rear wheel going light and skipping about on the rebound but two oversize roadtesters is asking a lot of any suspension set up. No complaints from the pillion about the riding position though. The rear portion of the seat is just a touch higher than the front and there's a big meaty grab rail to hang on to. Riding solo was quite a refreshing experience and I came to enjoy heaving the bike over into corners. Photographer Kenny P never had such a willing victim as I swung back and forth, feet over the edge of the pegs, feeling for the road which comes up so so early. The XJ900 isn't the nimblest bike in the world and trying to change line in the middle of a corner isn't a pastime I would recommend riders to indulge in too often. The bike is better suited to sensible people who don't take chances on that unexpectedly sharp exit or the pile of poo on the apex of corners. Those same sensible people will also appreciate the Krauser panniers on our model. Though not big enough to accommodate a large full face helmet, they complement the bike perfectly. Locks, while functional, don't look the most thief-proof security devices but the panniers detach so easily you'd probably whip 'em off and take 'em with you. Well I would. Overall finish was okay. With a little over 2000 miles notched up, one or two of the nuts and bolts had acquired a white coating. Unlike the later plastic-wrapped bikes that come up shiny with a quick blast of the jet wash, the Yamaha is a machine that you have to clean properly. It's a Sunday morning job with toothbrushes, Solvol Autosol and small pieces of cloth. It's not a bad little job when you've nothing else to do, but heartbreaking when you just know it'll pee down within hours. For some reason the front mudguard had developed an unsightly crack down the middle over the bracket that doubles as a fork brace. I don't know if this was a result of debris thrown up from the wheel or whether the bracket doesn't do enough to stop the forks pulling the mudguard in different directions. Anyway, to sum up; panniers, efficient wind-breaking fairing, comfy seat which licks up the rear end of the tank, respectable fuel range (I could manage over 200 miles from a 4.8 gallon tankful of unleaded if I behaved myself), clock, shaft drive. It's obvious really isn't it?